Hot on the heels of the Quarryman’s Trail cycleway consultation, another Major Cycle Route is also currently seeking public feedback. 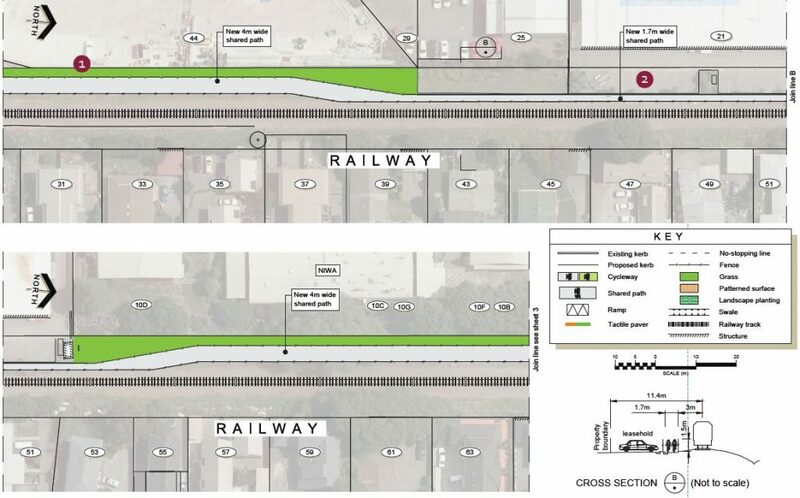 The Northern Line cycleway will take the existing much-loved Railway Cycleway and extend it further north and south, all the way from Addington to Northwood. The final long-term route north beyond reaching Main North Rd remains up in the air as there is still a lot of development to be finalised in this area. It could follow the railway corridor, the Styx River or the main road – or all of the above. 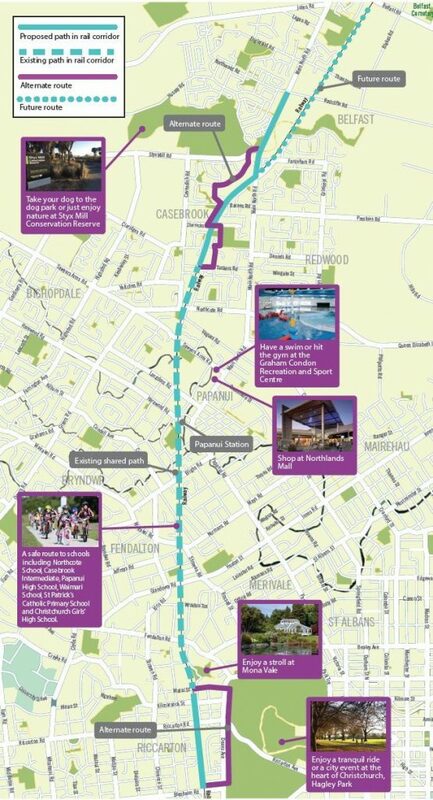 Unlike many of the other cycleway projects, this one is interesting in that the railway corridor provides an obvious route all the way along. That’s not to say that other alternative routes haven’t been considered. Rail corridors present their own challenges (especially when they’re space restricted), so alternate route options have been presented for the north and south ends of the project. Essentially they follow already existing cycling routes (e.g. through Hagley and Redwood Parks) and thus they would still exist in some form even if the railway routes were constructed. For this reason alone, creating the new routes along the railway corridor would help to expand the actual network of available cycling links. Things do get a bit tight at the bottom end for now though. An existing lease of railway land for car-parking means that (for now at least) one section is only 1.7m wide for about 100m. Still, the signalised crossings of the main roads will make it a lot easier to get along the route in a safe and convenient manner. Hopefully they will continue to use the advanced signal detectors on the approaches that make for very minimal waiting delays. New signalised crossing at Riccarton Rd – but why is the crossing offset from the path? 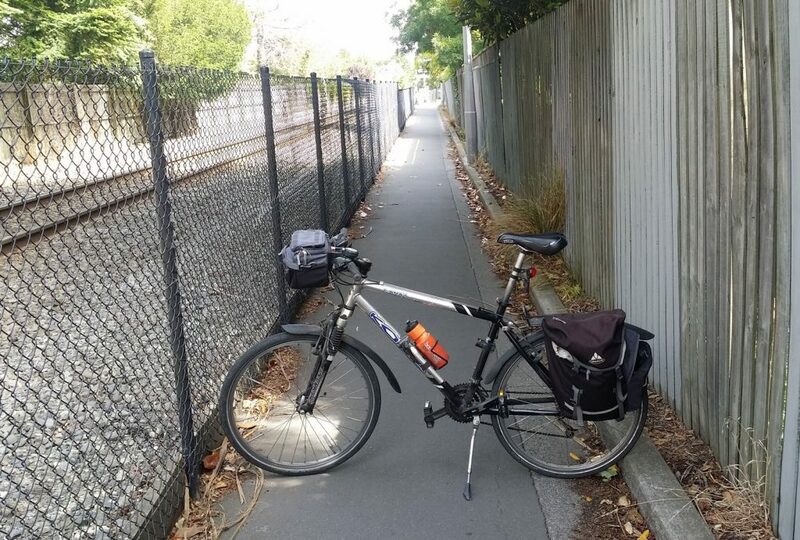 Further north, the creation of a clear path from Harewood Rd past the old Papanui Railway Station will also be a blessing for the many people confused in the past about where to go to next (mind you, a couple of well-placed signs could have solved half the problem…). A pity that the path has to go in front of those car parks for the restaurant. And that path coming out of St James Park could definitely be widened. 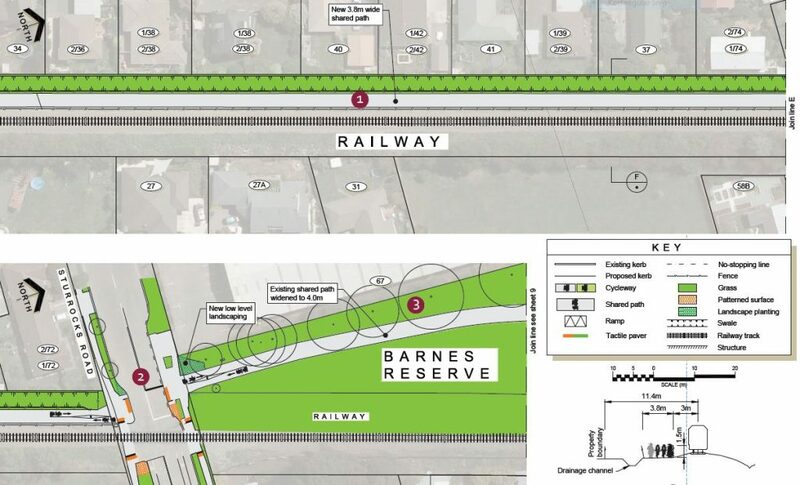 North of Tuckers Rd, a new pathway is proposed to extend the existing route along the railway corridor. However, a number of other route options were also considered, making use of existing streets and reserves instead. Some of them are certainly handy cycle routes in their own right (e.g. into Regents Park) and should be maintained or improved for cycling. Most of the new pathways are proposed to be between 3-4m wide, depending on available corridor width. Only where the railway corridor is squeezed (usually because the land is temporarily occupied by someone else) have widths had to be narrowed; hopefully when these leases come up these pinch-points can be rectified. Another thing that would be nice to consider is the addition of extra links from the railway corridor to adjacent streets; it seems crazy that some people living right next to this pathway can’t conveniently get access to it. On reaching Main North Rd, the pathway follows the road corridor towards Styx Mill Rd and Northwood. There seem to be a couple of missed opportunities to connect into the residential streets within Northwood, so hopefully those links get added. And the ending at Northwood Boulevard needs a bit more clarity, rather than just petering to nothing. Of course the elephant in the room with this project is what about improving parts of the existing cycleway? We know that there are sections of the cycleway that are currently less than 2m wide; certainly nowhere near the recommended 3-4m for a busy shared pathway. 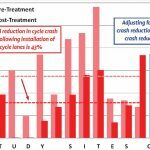 The planned improvements (plus the other Major Cycleway routes) will only serve to grow cycling numbers on this cycleway, which is likely to lead to congestion and frustration. When will these sections be widened? Public consultation is open until 5pm Thu 17 November, so have your say now. Once again, as well as conventional submissions, you can also provide your thoughts via the interactive feedback map – it’s a great way to zero in on specific issues along the route. If you want to know more about this route, you can also join Spokes Canterbury on their Northern Line submission ride this Sat 12th starting at 11.30am from the end of Lester Lane and heading north towards Northwood. So come along and learn more about this project. What do you think about the Northern Line cycleway project? I enjoy a nice smooth free-flowing bike lane, whether its in the roadway or separated. The downsides of the railway path is that the cycle traffic is isolated from the motorised vehicle traffic, so its invisible and hidden. Normalising cycling as a transport solution is partially achieved by making it commonplace, and "normal" This is not done by hiding bikes in their own corridor.